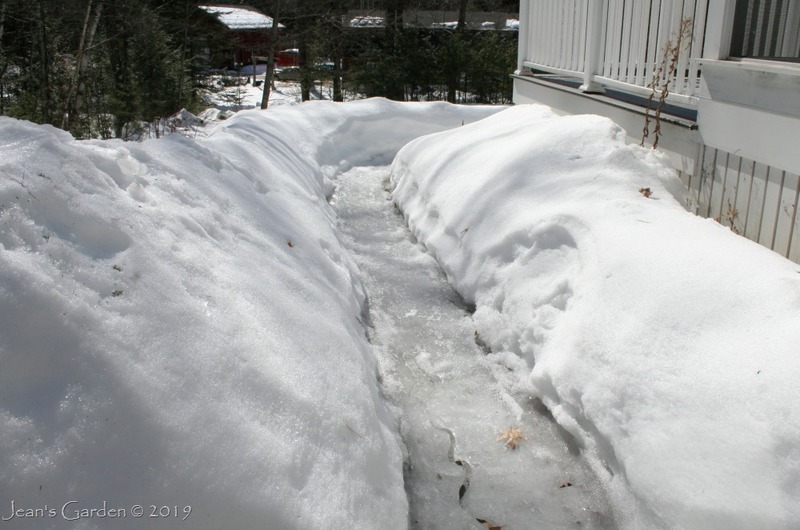 In mid-March, there isn’t much sign of spring on the ground in my Maine garden, which is still hidden under a blanket of snow. But we’ve had a series of days with temperatures well above freezing, and spring is in the air. 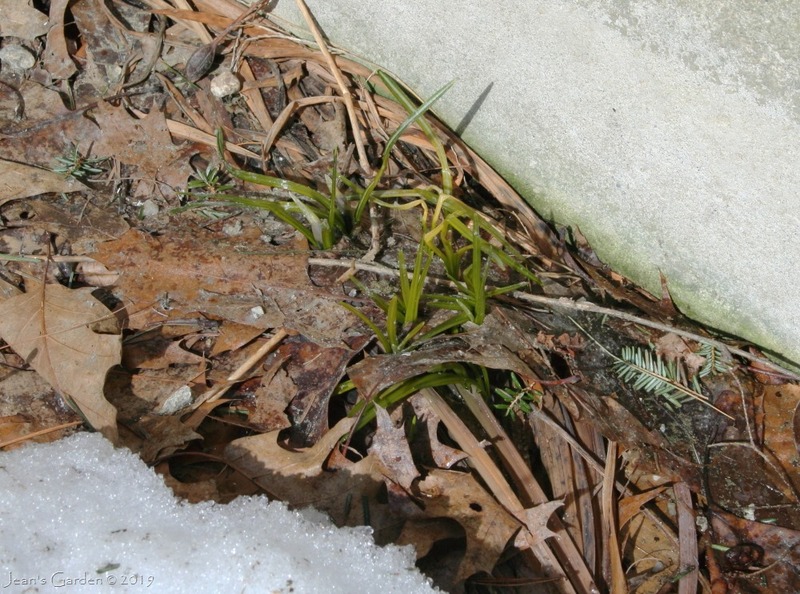 A closer look reveals some subtle signs of spring on the ground, too. 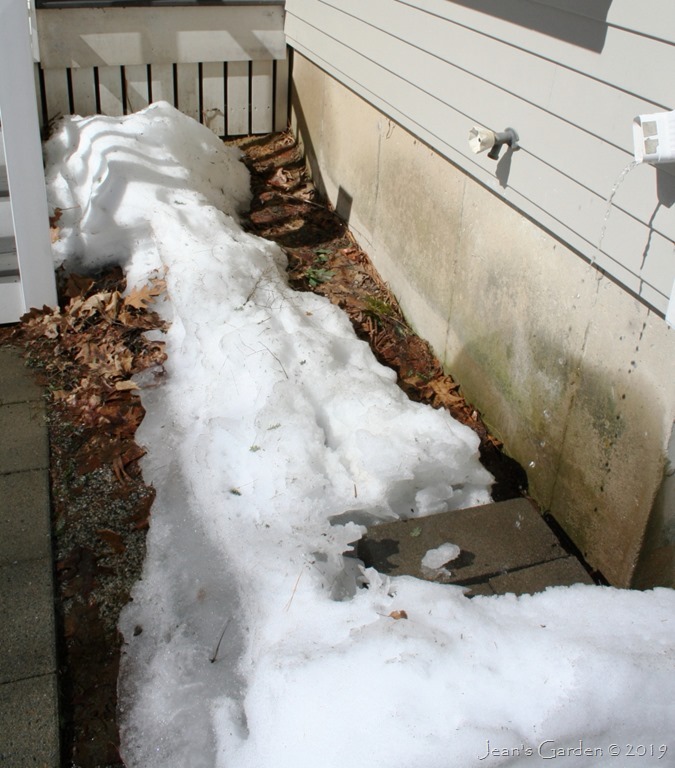 The foundation at the front of the house absorbs enough heat from the sun to melt the snow. And when it does, new green growth appears underneath. Meanwhile, indoors, my impatience for spring flowers is being assuaged by blooms on my potted amaryllis (Hippeastrum) bulbs. ‘Charisma’ is blooming on the living room window ledge. It is a special treat on sunny days when its red freckles, streaks, and picotees are backlit by the sun. In the bedroom, this flame-colored flower greets me when I wake up each morning. I especially love the way it glistens in the sun. Garden Bloggers’ Bloom Day is hosted on the 15th of each month by Carol at May Dreams Gardens. Visit her blog to see blooms from gardens where spring has already sprung! Hi Jean, it seems like your winter is so long, those snows are still so thick. But at least you have colors even inside. 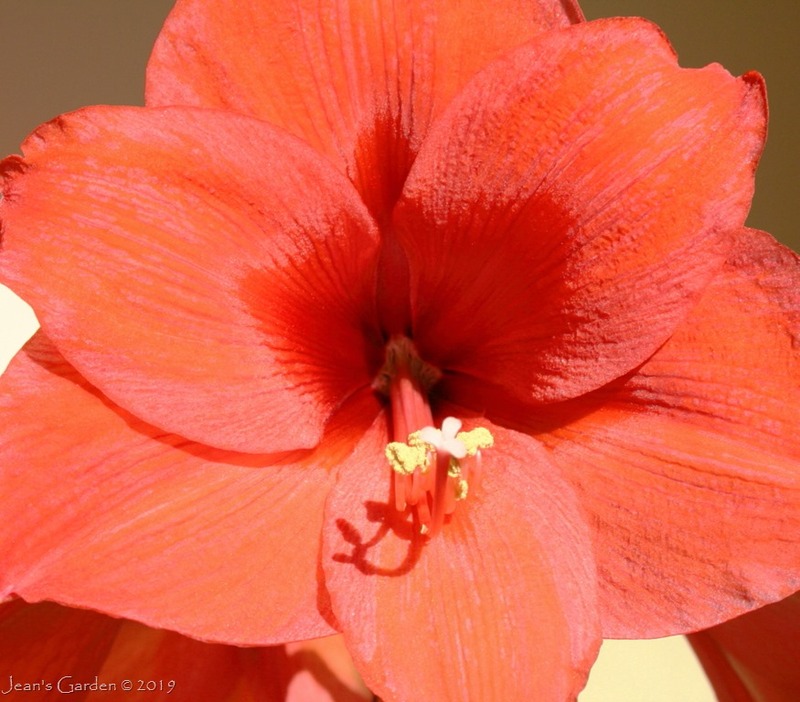 We both have hippeastrum blooming, mine i just induced blooms by putting on water. Otherwise they will bloom still in May after the first heavy rains. ‘Charisma’ is a beauty, especially when backlit. It’s not only beautiful, but one of my most reliable bloomers. It currently has two offsets, but I’m hesitant to separate them for fear of losing the blooms for a few years by dividing the bulb. Hi Jean, happy almost-spring! 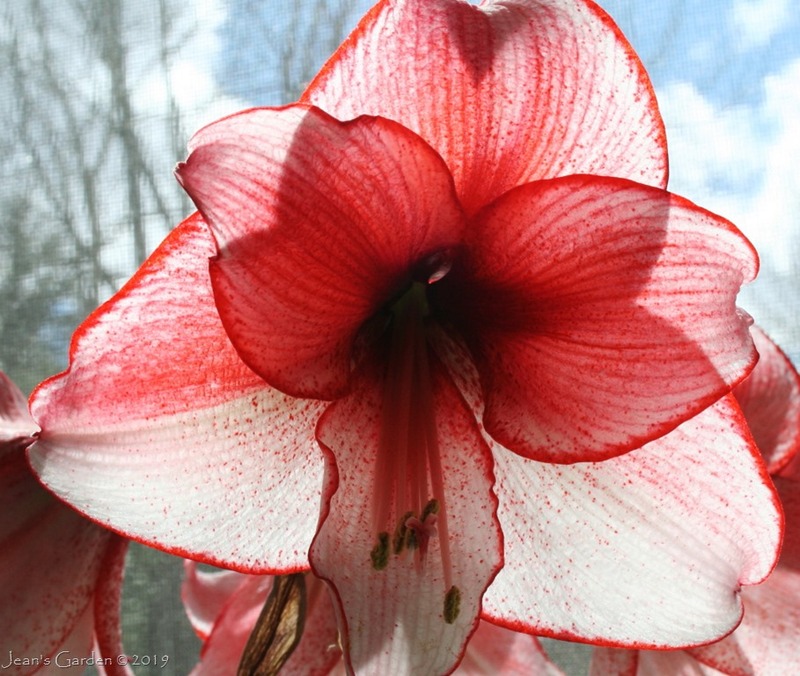 Your amaryllis are spectacular. Charisma is well named. It must be a fantastic contrast to the snow outside. Deb, the indoor blooms with strong colors are a great contrast with the snow, especially when they are backlit by sunlight reflected from all that snow. As spring slowly gets here, though, I’m ready for more spring-like colors. I was happy with my African violets blooming indoor until I saw your Charisma. Beautiful. Outside in St. Louis I have a few random snowdrops blooming that the chipmunks managed to miss. Debbie, Of my various potted amaryllis bulbs, ‘Charisma’ is one of the least demanding, blooming reliably each winter without much fuss. 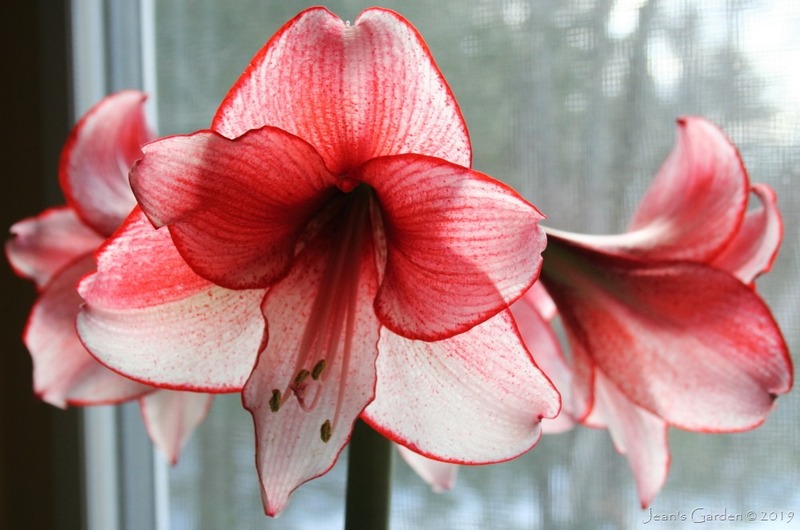 What a fantastic shade of Amaryllis …We are in our mid spring and hoping to get amaryllis blooms this month. Have a great week ahead. Arun, Winter is a long season in Maine and one of very muted colors, which makes those vividly colored flowers all the more delightful. Oh, I have not done this meme in a long time. It can be so addictive. Tony, I agree; Garden Bloggers’ Bloom Day is addictive. I think of it as an online garden club meet-up. Beginning to feel an autumn nip in the air here – which is encouraging my garden to sigh with relief and bloom. Diana, Both your garden and mine are coming into bloom with the change in season. 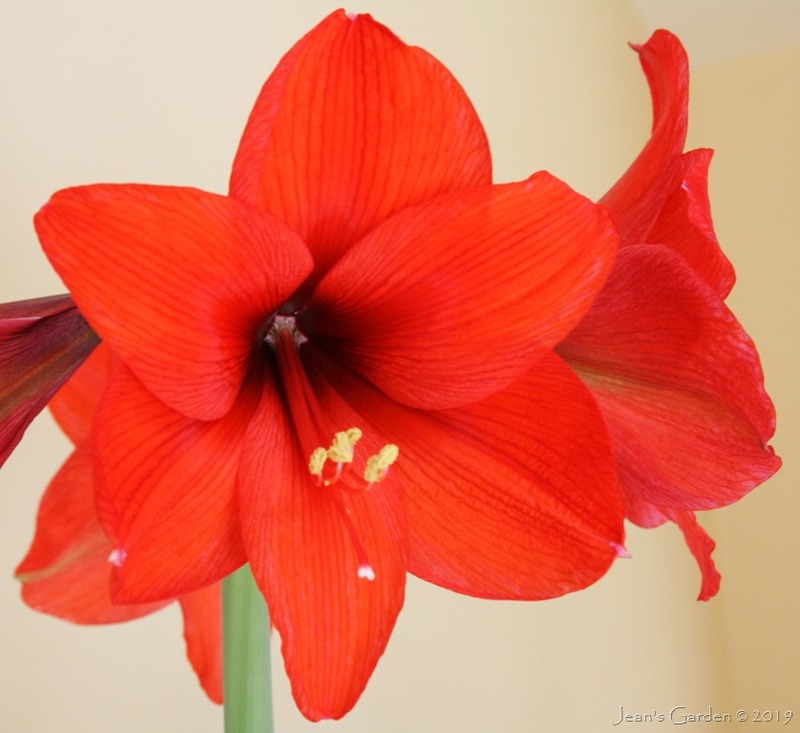 Hello Jean, I really like the Amaryllis “Charisma”, especially back-lit like that. It almost looks like stained-glass, beautiful.